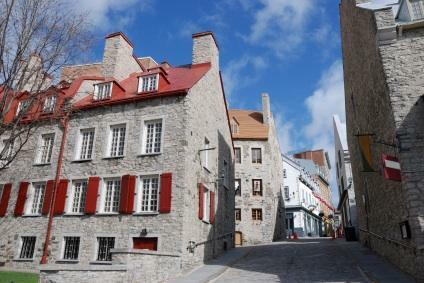 In Quebec City, French is the dominant language. The official language of Québec is often confused with the official languages of Canada. While Canada is officially a bilingual country (French and English), Québec is officially a unilingual province; the official language of Québec is French. Similar to the situation in the US, where national and state laws sometimes differ from one another, so it is also with the provinces of Canada. Officially, Canada is a bilingual country, which means that all governmental services have to be available in both official languages of the country. However, in the Province of Québec, the local, provincial law overrides the national law. Officially, Québec only has one language, and it is legally only required to offer governmental services in French. In practice, there are regions of Québec where many English speakers live, and English speakers who do not speak French are not left stranded every time they need official paperwork. The Province of Québec is just one of the many French speaking areas of the world where French is an official spoken language. While only about 7.5% of English-speaking Canadians are also fluent in French, some 40% of Québec's French-speaking population is also fluent in English. This discrepency is sometimes cause for debate. In Québec, where the official language is French, many citizens, especially those in the metropolitan region of Montréal, become bilingual. This is not only a result of living in a metropolitan area where both languages are prevalent, it is also the case that residents of this region can have difficulties finding a job if they are not officially bilingual. In more rural regions of Québec, it is much more common to come across native French speakers who are not fluent in English. French is the official language of business: An English native speaker must become bilingual so that he can participate in business in French. French is the official school language (through high school graduation): All children in Québec must attend (public) schooling offered in French. Only children who have one (or both) parent(s) who also attended an English-instruction primary school are allowed to choose for an English primary school. This means that an American English-speaking immigrant would have to attend a French-speaking school. While these are only officially four rules, they encompass many aspects of life in Québec. The laws are disputed by some, but heavily protected by the strong desire to protect French as Québec's one and only official language.